In 1861, Virginians in the northwestern part of the state defied Virginia's secession from the United States. The region chose to remain in the Union and form a new state. 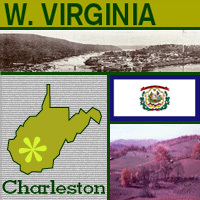 West Virginia was admitted into the Union in 1863, after conditions requiring the gradual emancipation of slaves had been met. The state motto is "Mountaineers are always free," and West Virginia lives up to its nickname of the "Mountain State." With an average altitude of 1,500 feet above sea level, it's the highest of any state east of the Mississippi River. For a long time, West Virginia was a leading producer of coal in North America, but many people left to pursue better employment opportunities. That trend has turned around, and now the state's economy is in a more stable condition. The capital is Charleston, and the state flower is the big rhododendron. "West Virginia Italian Heritage Festival"
"Winter Festival of Waters (Berkeley Springs)"
Is it a town? Is it a boat? So Long, Old Man Winter! The Thundering Sound of Battle! "The Mountain Weavers Guild and Fiber Art Traditions in the Potomac Highlands"